I'm not that picky when it comes to desktop audio player. Typically, I just use whatever audio player that comes with my Linux distro. As long as it plays all of my audio files (with the right plugins of course), I'm good. Until most recently, when I've tried those iTunes replacements that I wrote about a while ago, I've discovered Songbird, and it quickly became my favorite audio player. 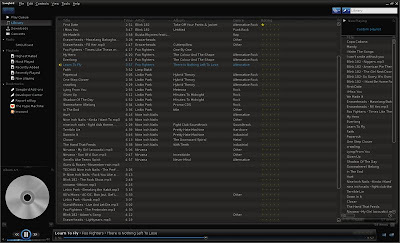 As described on its project website, Songbird is an open-source customizable music player that's under active development. The project’s main aim is to create a non-proprietary, cross platform, extensible tool that will help enable new ways to playback, manage, and discover music. If you are using Ubuntu or any other Debian based distro, you can download the .deb package HERE. You can also download Songbird directly from their website HERE. Songbird has an iTunes-like interface, so playing and managing audio files in it is completely trouble-free. If you don't like the default appearance of Songbird, you can customize it by getting some of the good-looking ready-made themes (called feathers), and then simply install it the way you do in Firefox. Smart Playlist- lets you create dynamic playlists that automatically update based on criteria you set. Last.fm Scrobbling- Last.fm integration which allows you to scrobble, love, and ban your tracks. 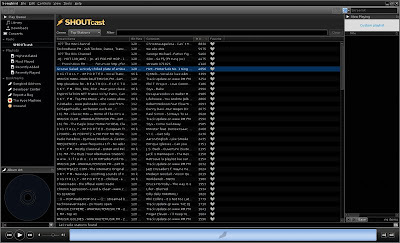 SHOUTcast Radio- ability to stream music through SHOUTcast Radio directory. Because Songbird is still in beta, some of the features are experimental and need to be polished as pointed out by its developers. Songbird is my ideal audio player. It's light, fast, easy-to-use, and highly-customizable. Plus, it is fairly stable even though it is still in beta that I'm keeping it as my primary desktop audio player. If Songbird will continue to improve along the way, it won’t take time before it will become “the Firefox of media players”. Really nice app ;-) It's like linux version of iTunes ;-) But more faster. Thanks for this review of Songbird. I've tried other audio players for Linux but some are not stable enough for day-to-day use especially when changing themes and adding plugins. I'm downloading Songbird right now and I'm keeping my fingers crossed. Songbird is pretty cool, and is getting better all the time. I tried it last year, and was not impressed - but it was the first public release. I was not expecting much. Now with the add-ons getting much better, Songbird is almost ready to fly, but is still getting it's wings. For now I will stick with Amarok, but by this time next year I will probably be using Songbird. It is growing on me! Really nice Radio. I like it very mach. Looks pretty damn neat. Nice to see an Open Source version of some form of Media Player software that is, for a change, actually any decent. I use OS X and had abandoned iTunes for everything except updating my iPod, because much of my library is FLAC. I refused to use Apple's proprietary ALAC format. As such, there was no decent player/library manager on OS X until Songbird came along. I am a Windows user myself, but I felt that the release candidate of Songbird ran too slow for my tastes. The program is definitely bloated in Windows, and it has been less responsive than iTunes from personal experience. I am a big fan of Songbird's concept though, and I hope that it gets cleaned up soon. 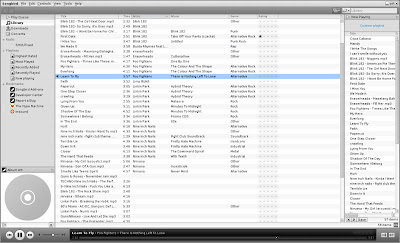 =P Id like to change away from Windows Media Player, but the problem is I have all my playlists and rankings in Windws Media Player and can´t bring them to Songbird. And I didn´t find an add on to do this. Wow, I am impressed. Songbird DOES rock! Super cool. Songbird does things I didn't realize that I wanted in an audio player. I can totally see it changing how I explore and listen to music. I love Songbird... unfortunately, and I don't know if it's unique to me, it's using over 100MB of memory when it runs. That's not acceptable. I tried it but MediaMonkey won me over with it's speed, tagging features, Amazon album cover search, it has Last.fm scrobbin. MediaMonkey does have a higher learning curve but with time you'll love it. Will try Songbird once it comes out of BEta. ho baby. you r for-gettin VLC! I'm keeping my eye on it(Leopard user), I'm a firefox user and I absolutely love the customization of it, and I would really like to see the same kind of speed and customization in my media player. The one thing this player NEEDS, though, for me to switch, is the ability to use Quicksilver to search through my music and play without having an open window... I use that ALL the time. Once it's a stable release and I get thumbs up in reviews I'll check it out. I really dont like the itunes way and feel and hate full screen players. but for those who like this way of doing things, good stuff. Free software does elegant well now as well as solid. choice of applications to use. Forget trying to use this app with a large music library. Dead slow. I like Foobar to sync to my ipod. It uses a lot less memory than itunes. I am listening to mp3 since my Intel 286 computer was stuttering to play it. I never needed any fancy itunes-like player, because it is not really needed. All those bloated apps do is to embed some file manager functionalities, which the OS lacks. I never understood why people would need anything more than say Winamp, XMMS or Foobar, especially when it can't decode mp3 optimally (using madlib) and accept DSP plugins like Audioburst or DFX. I'm a Mozilla fan, a Firefox lover, but concerning SongBird, not convinced. It does manage music nicely, the GUI is a success, but ... remains the essential, that is the sound! I love music and no player has met my requirements as AIMP player has, though its functions are not as elaborated as those of SongBird... but the sound (try jazz, try classical, try chords and voice...) is gorgeous. Wow, I am impressed. Songbird DOES rock!. Really nice Radio. I like it very mach..
Wow, I am impressed. Songbird DOES rock!!! Forget trying to use this app with a large music library. Dead slow.. I like this app but still too slow compare to foobar2000 ie. Maybe it will be better next version ?